Here are some of my favorite railroad photos that I have taken over the years. I've made several different portfolios to make it easier to find pictures of interest to you. Last Updated August 9, 2014 with 2 new Copper Basin photos! The Yellow highlighted areas indicates where the newest photos and/or updates are. 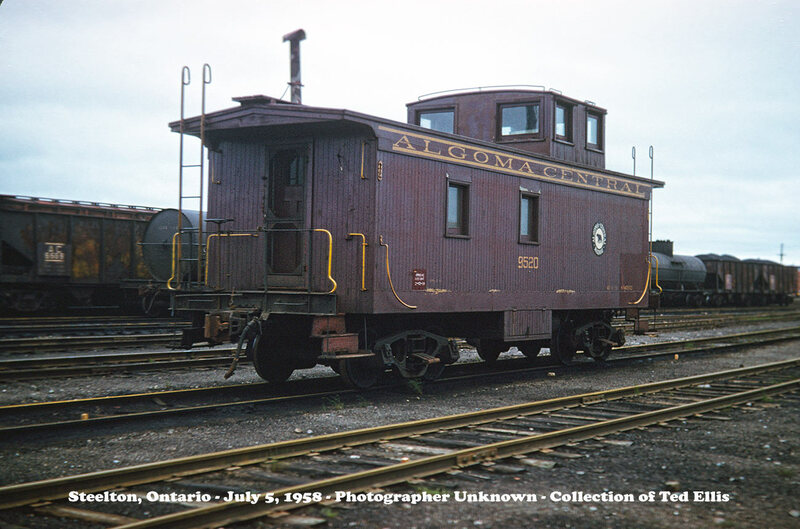 Unofficial Algoma Central Home Page Here you will find several pages of Algoma Central Railway Photos, including rosters of engines, cars, work equipment, stations and other photos. A photo of the 9520 van taken in July 1958 added September 12, 2013. This page has other Canadian photos, mainly from the western provinces, but also including a trip to Churchill and to the Quebec Cartier. Desert Rails The Railroads of Arizona! Here are photos of all known railroads here in Arizona, grouped by railroad. New Photos! Here are some random photos taken within the last few months or so. Last updated August 9, 2014 with the Copper Basin 304 in its new paint colors. Storm Light & Night Photos! Now that I am shooting digital I've been experimenting with types of photography that I rarely tried before account the cost of film. With digital, if the shot doesn't turn out I just delete it or enhance it (some would say "doctoring") with Photoshop. And also the newer digital cameras are much more flexible under various lighting conditions. 6 New Night photos added May 6, 2014. Old, Rare and Obscure I first started shooting Kodachrome in Upper Michigan as a teenager in 1964. Here are some of the better photos from then of the various railroads in Upper Michigan, Northern Wisconsin and a few other places. Steam Although I've never been a really big steam fan, I do enjoy getting them on film. Grand Canyon Ry Railfan Weekend Here are the photos of the ATSF 3751 NRHS Special on the Grand Canyon Ry. The Grand Canyon Limited Ten years after the above NRHS Special the ATSF 3751 once again visited Arizona and the Grand Canyon. May 2012. Photos added May 22, 2012. 2001: An ACR Odyssey! I spent the first 2 weeks of July of 2001 in Upper Michigan and Northern Ontario to get the last of the ACR and WC before the CNR takeover. The weather was good for the most part, and it was the first time in 5 years that I had been to the ACR. Road Trip 2002! 2002's railfan trip was a road trip of about 5800 miles around the western part of the US and Canada. We got the Utah, Rarus/MTW, BNSF, CPR, MRL, BCR and various other railroads. Photos from this trip are posted in 3 sections - enjoy eh! Finished posting all photos Aug. 20, 2002. Northern Ontario 2003! 2003's trip was a 2 1/2 week road and flying trip, with the main objective getting as much of the Ontario Northland Railway as possible before any merger. While the weather basically sucked for the most part (!! ), we did get some nice ONR photos, as well as other soon to be retired equipment. Road Trip 2004! Last year's railfan trip was to the National Train Show in Seattle, Washington, with a week before and after the train show for foaming! I got some good shots of the Utah, BNSF, Montana Rail Link, and the Black Mesa & Lake Powell RR's. Road Trip 2005! This year's railfanning expedition was to drive to the National Train Show in Cincinnati, while burning a lot of film on the way there and back, as well as stopping at various hobby shops. Road Trip 2007! Coming soon! 2007's trip was to the National Train Show in Detroit, Michigan. Road Trip 2009! Once again I was able to get on the road and burn a lot of film traveling from here in Arizona to Montana and back, filming everything I could. Road Trip 2012! This was a 5300 mile driving trip from the Phoenix, Arizona area to the National Train Show in Grand Rapids, Michigan and then across Upper Michigan and back towards Arizona. It was a great trip and my first long trip since going over to the Dark Side, as in shooting only digital photos. July/August 2012. Road Trip 2013! This year's Road Trip was later than usual seeing as how it was time to see TrainFest in Milwaukee again. It was 2 weeks on the road, and I did get some decent shots of leased power on the GrainBelt in Oklahoma and also some decent Arkansas & Missouri photos as well. Posted December 3, 2013. SP Semaphores! Blades! Here are 19 photos from a trip to the Carrizozo, New Mexico area on the ex Espee line that at that time still had *real* semaphores (as in lower quadrant) in service. These semaphores have now been replaced by tri-lights, so I feel lucky to have been able to get some photos of them! Oregon! Here are some photos taken while on a business trip to the Grants Pass/Medford area in July of 1995. While I didn't get as many shots of the semaphores as I would have liked to, at least I got a chance to see a couple of new (to me) railroads. Chicago! Some more oldies have recently surfaced and are now scanned and posted for your enjoyment. This were taken in the mid to late '60's in the Chicago area back when I was a teenager. The Twin Cities! Seeing as how I have been going through my old slides with the above subject, I also found a bunch of slides taken on a trip to the Minneapolis/St. Paul Minnesota area in November of 1966. The second section is photos of my July 1970 trip to the area. Santa Fe Semaphores! More Blades! Here are photos from a June of 2000 trip to the Raton, New Mexico area. While there are not a whole lot of trains running in this area, the Santa Fe semaphores are quite accessible and make for a great photo. These semaphores are also being replaced at this time, so get your photos now! Running Extra Not all of my photos are of railroads! Here are some of my other photos that are a little bit different, or ones that I just happen to like. The Caboose And here are some links to other sites, odds and ends, and a little bit about myself :). I hope you enjoy these photos! You can send me e-mail at Desert-Rails (at) cox.net with any comments, flames, ideas, etc. - I'd like to hear from you. This is my first effort at building and publishing a web page. Thanks also to Henry at Railfan.Net for all of his help, patience, etc. with helping me getting this all together! This website is optimized for Firefox - Internet Exploder or other browsers may not show everything correctly! This Web Site and all pages and photos within it are copyright ©1964-2014 by Ted Ellis (unless noted otherwise). All rights reserved. This Web Site was first published July 2, 1998 back in the Dark Ages of dial-up Internet access!